Heat oven to 375°F. In large bowl, mix cookie mix, flour, butter and egg until dough forms. Divide dough in two; cover bowl with plastic while working on first batch. Place one-fourth of the dough on lightly floured surface. Roll to 1/4-inch thick. Cut cookies with 3 1/2-inch round cutter. Place on ungreased cookie sheet. Bake 5 to 7 minutes or until edges are light golden brown. Cool on cookie sheet 2 minutes before removing to cooling rack. Repeat with remaining dough. Lightly frost all cookies, about 1 tablespoon per cookie. Cut fruit-flavored rolls in half lengthwise to make 1/4-inch strips. Cut 28 (number of cookies) 4-inch strips and fourteen 3-inch strips. Twist and place larger strip on center of cookie. Place shorter strips, twisting 1/2 inch from bottom edge, parallel to center twist. Add 1 or as desired Gushers snacks. Repeat for remaining cookies. 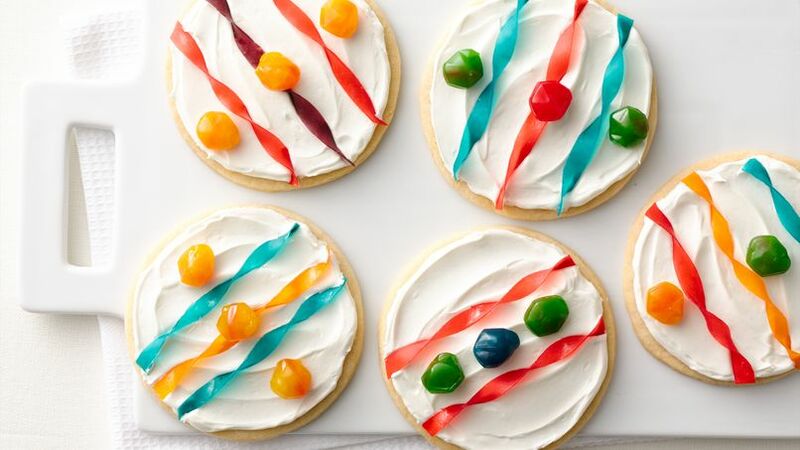 A fruity colorful cookie for this holiday season.